We know our polishers will save you money. To prove it we'll give you a free trial at your premises. Our Cutlery and Glass polishers have enabled national restaurant chains, fish and chip shops, cafes, hire centres, golf clubs, luxury hotels and fine dining establishments alike to benefit by raising standards in efficiency, presentation, hygiene and by maximising profits through controling costs.Spoonshine offer a range of polishers to suit the throughput and budget of establishments large and small. Do you have clients that could be benefiting from a Spoonshine Polisher right now? First impressions last as they say and nowhere is this more true than in the hospitality industry. The tableware you present to your customer says everything about how much you care about your product and, crucially, how much you care about them. The percieved cleanliness of your establishment and the utensils that you expect your clients to put in their mouths is a huge part of the dining experience. A happy, relaxed customer is likely to stay longer, eat and drink more, return earlier and more often and recommend you to others. The pride you take pays off and our polishing products can help by maximisng your front of house presentation and ensuring hygiene. Industry tests show that even on a good day the best operative can only adequately polish 400 pieces of cutlery an hour. 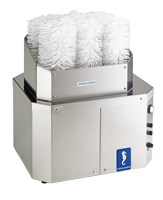 Our polishing equipment is capable of between five and thirty times that amount, enabling huge labour savings and freeing up staff to do more important tasks such as upselling and looking after your customers. 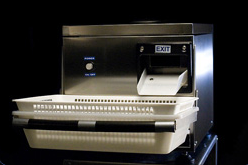 If you are servicing 60 or more covers a day we can save you money. Many of our clients were regularly paying upwards of 40 hours wages per week for this task to be carried out to varying standards. For some of our larger customers this figure runs into 100s of hours saving £1000s for the establishments concerned. Check the Cutlery Polisher Savings and Benefits page to see how much you could be improving that all important bottom line. Not only do our polishing products give you the reassurance that comes from knowing that you are taking care of presentation and hygiene whilst maximising profit through efficiency, they come with the peaceof mind that Spoonshine provide through our established care and service programs. We are the sole UK importer for Italian designers Hyppocampus Products - a world leader in the production of catering and polishing equipment. We have supplied thousands of polishing machines to the catering industry, enabling businesses large and small to benefit. For the last six years we have established a standard of care that literally takes us from Lands End to John O' Groats and allows us to trade with independent, national and internationally based companies demanding a high and exacting level of service. This year we have been independently assessed by quality assurance company Altius and have been registered as Assured Vendors. Spoonshine are ranked as Assured Vendors status after independant assessment by Altius for quality of service.